The Ultra 182 arm mounts in a narrow footprint of just 3″ and stows tightly against the wall. The mounting arm rotates up to 360 degrees horizontally and has horizontal and vertical reach of 24” (61 cm), so you can place your computer exactly where you need it. To extend the reach, an Ultra A1 arm can be added to the configuration. The Ultra 182 arm is counter-balanced, making it effortless to move in any direction. Internal cable management creates a neater appearance, protects wires and simplifies cleaning. Adjustable rotation stops protect the equipment and facility from damage. Machined from strong billet aluminum, the unit is powder coated for a durable, lasting finish. ICW computer mounts are designed, engineered, manufactured and hand-assembled with complete attention to detail. The Ultra 182 mounting arm will provide years of dependable service. The Ultra 182 computer mounting arm supports up to 32 lbs (14.5 kg) and can be custom configured to meet your needs. 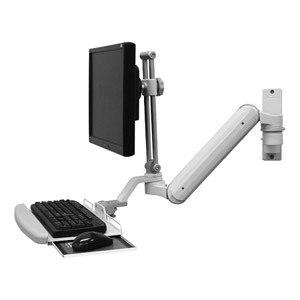 The Ultra 182 arm enables an LCD and keyboard to be suspended on a 3” wide wall mount, pulled out when required, and stowed out of the way when not in use. The Ultra 182 arm is machined out of billet aluminum for strength and durability. The Ultra 182 arm provides up to 24″ (61 cm) of vertical adjustment. Configured with the Ultra A1 arm and a flip-up keyboard tray, the arm reaches 45″ (114 cm) horizontally.